On behalf of my wife and my colleagues, I wish to thank you for your kind invitation and gracious hospitality. This saying is an exact description of Guernsey and its relations with China. The size of your island and population has not affected your exchanges and cooperation with China. Rather, China-Guernsey cooperation has many highlights. · The China Banking Regulatory Commission and the Guernsey Financial Services Commission have signed a letter of intent for cooperation. · The China Securities Regulatory Commission is also working with Guernsey on a similar document. · China’s financial centre Shanghai has signed with Guernsey an MOU on cooperation. · Both Shanghai Stock Exchange and Shenzhen Stock Exchange have established links with Guernsey. · Companies registered in Guernsey are allowed to trade on the Hong Kong Stock Exchange. · A number of Guernsey wealth management companies have entered the Chinese market. In the future it is certain that Chinese financial markets will further develop and expand. Chinese financial enterprises will continue with their efforts to go global. Given these trends, I have no doubt China-Guernsey ‘win-win’ financial cooperation will enjoy even broader prospects. Another pride of Guernsey is your agriculture. I visited two farms this afternoon and learned how the Guernsey cows and goats are truly worthy of their fame. So I am glad to learn that China and Guernsey have had good cooperation in animal husbandry and dairy. In economy and trade, we also have success stories. There are more than 1000 Guernsey companies doing China-related business. Dozens of Chinese companies are registered in Guernsey. Related to that, the Tax Information Exchange Agreement between China and Guernsey already took effect last year. Guernsey also has rich cultural and tourists resources. This is where English and French cultures meet. The story of Les Miserables is well known in China. So, Chinese visitors will be most interested because here in Guernsey Victor Hugo composed his masterpiece. Guernsey and China also have an exchange student programme. I believe such programme will deepen understanding and friendship of our young people. Guernsey is a British Crown Dependency. That means that the development of China-Britain relations will open up more space for China-Guernsey relations. 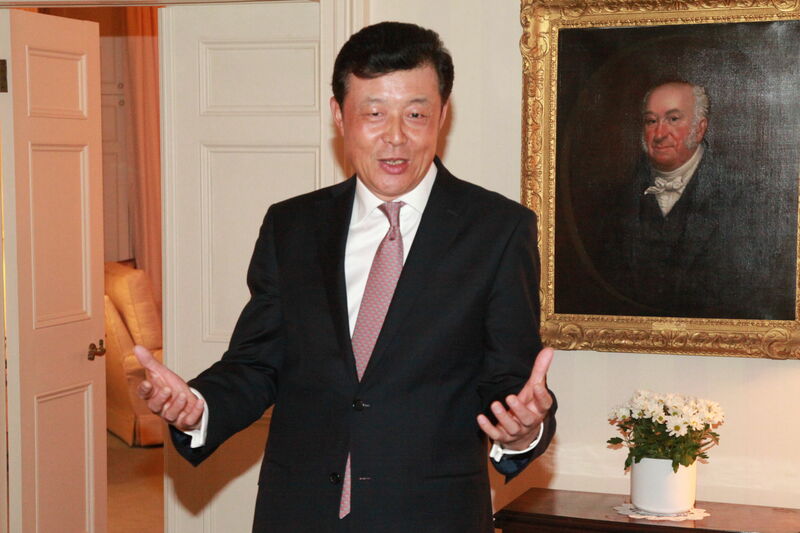 · Also in last year, Chinese enterprises invested over 8 billion US dollars in the UK. · The City of London last year launched the initiative to strengthen London’s position as the western hub for international RMB business. · Central banks of our two countries are planning to sign currency swap agreements. Moreover, China and Britain have conducted frequent people-to-people exchanges and fruitful cooperation in education, science and culture. As Chinese Ambassador to the UK, I hope my visit will further promote both China-Guernsey relations and China-UK relations. So how may relations evolve in the future? · Realise the Chinese dream of economic growth, national revival and the contented life of the people. That means China will continue as a major driver of global economic growth. In turn, these economic strengths will bring more opportunities for China-Guernsey relations. The ground for China-Guernsey relations has been well prepared. It is now time for us to sow new seeds of cooperation. In that we can be confident about a bumper harvest!